Logitech International and V-cube Form Strategic Alliance | V-cube, Inc.
Logitech International (HQ: Newark, California, President & CEO: Bracken P. Darrell, hereon as Logitec), the parent company of the world leading company of business devices, Logicool, Inc. (HQ: Minato-ku, Tokyo, hereon as Logicool), and V-cube, Inc. (HQ: Meguro-ku, Tokyo, President & CEO: Naoaki Mashita, hereon as V-cube), the No.1 web conference service provider in Japan for 9 consecutive years, have formed strategic alliance that will promote sales and R&D of both company’s products and services in order to contribute to workstyle innovation of companies through visual communication services. Logitec acknowledges V-cube as the first partner in APAC for globally practiced Logitec Collaboration Program. Scott Wharton, General Manager of Logitech’s Video Collaboration Group and Naoaki Mashita, CEO & founder of V-cube, Inc. The first step of this alliance is to combine Logicool audio and video devices with V-cube video conference system to realize video conference with higher quality voices and videos with lower price than before. By enhancing competitive advantage in the market, we will provide the best products and services to customers in need of new visual communication services. Conference cameras for large group meetings, “Logicool GROUP CC3500e” (model number: CC3500e), which realize higher quality of video and even more upgraded quality of audio calls, will be adopted to V-cube video conference system “V-CUBE Box” as audio and video devices. 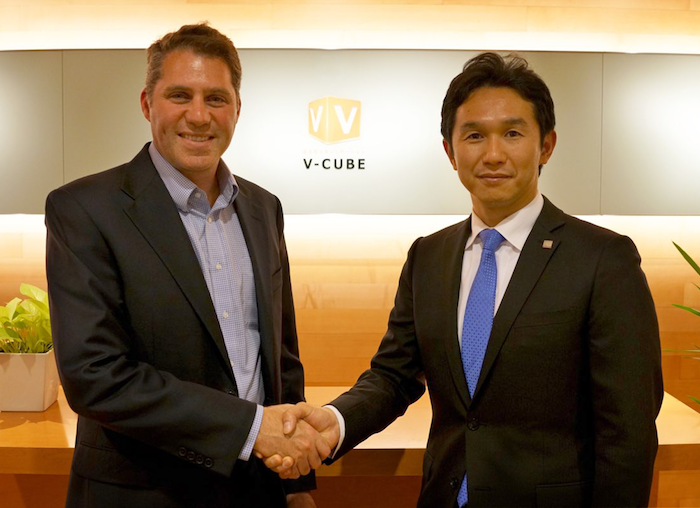 Logitech and V-cube form sales-partnership of “V-CUBE Box” to increase global sales. In order to improve customer usability of both company’s products and services, we will promote joint development of new features by combination of hardware and software, such as enabling navigation of “V-CUBE Box” and Logicool cameras with remote controllers from distance. Not only Large companies, but also SMEs increasingly adopt visual communication services represented by video conference system and web conference services as a means of realizing workstyle innovation of companies to improve efficiency and productivity. Furthermore, in the market where many kinds of visual communication services are supplied, replacement of video conference hardware has been expanding. Since there is large demand for video conference system of lower price and higher quality, we will leverage advantage of both company’s products and services to capture the customer needs. “Logicool Group CC3500e”, available since April 2016, is an audio and video device for a large group meeting that realizes higher quality of video and even more upgraded quality of audio calls. - High quality video with optical lenses by Carl Zeiss AG and image sensors with 3 megapixels at the camera head, digital zoom (x10), and autofocus. - Microphones with digital signal processing (DSP) that realizes clear audio calls on broadband. “V-CUBE Box” is a pre-setup video conference system with only one-third cost of the existing products. Installment is as easy as connecting to a monitor and the Internet, and a multi-site conference with real-time document sharing is easy to navigate with remote controllers. - Over 100 sites can be connected without specific equipment or lines. - Simple navigation with remote controllers. - Accessible from business trips with PCs, smartphones, and tablets. - 24/365 customer support, which reduces the management burden. Headquartered in the Switzerland, Logitech International is the world leading provider of customer digital experiences. Its wide ranged hardware and software corresponds to various platforms, to make a life with digital devices more comfortable. Its products and services range from controlling computers to music, video, gaming, social networking, Internet communication, video security, and home entertainment controls. Logitech International was founded in 1981, and is a publicly traded company in the Switzerland, and listed on Swiss Exchange (SIX: LOGN) and NASDAQ Global Select Market (LOGI). Logicool, Inc. is a wholly owned Japanese subsidiary of Logitech International. Refer to Logicool’s website www.logicool.co.jp for more information. V-cube provides visual communication services to enterprises by enabling audio and video communication between remote locations. V-cube’s main web conference and webinar solutions have dominated the Japan SaaS web conference market with No. 1 market share for 9 consecutive years. V-cube’s Visual Communication not only is applicable for internal meetings, but also helps customers with training, education, etc.